Take command of the Summer 2015 season with Star Wars™: Armada Tournament Kits! These exciting kits are now available for order through our B2B store or your distributor, but supplies are limited. 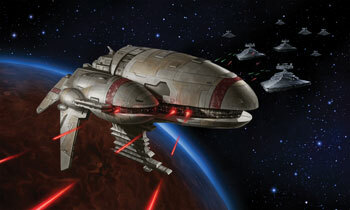 In Star Wars: Armada, players take on the role of fleet admiral, commanding Star Destroyers and Corellian Corvettes, sending engineers scurrying to repair shields, and unleashing torrents of laser fire through a flurry of tactical commands. 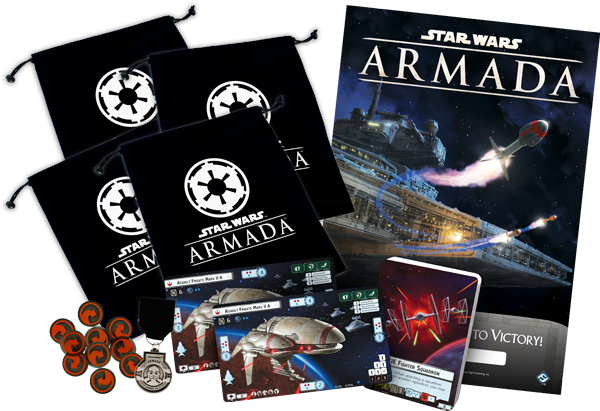 The Summer 2015 Star Wars: Armada Tournament Kit comes with an event guide and new promotional materials to help support tournaments, league play, or any other event you wish to run. The Summer season begins in July and lasts through October. How Do I Use a Tournament Kit? Tournament Kits are designed for use with our competitive games, such as Star Wars: Armada, and they can be used in several ways. These kits include prize support and promotional material designed to support competitive or casual tournament play at local retailers. Run an eight-week tournament series or league, use the prizes to support a single, large tournament, or host a weekly casual game night. Tournament Kits also come with a guide that provides tips and ideas on how to run a great event. What’s in the Summer 2015 Star Wars: Armada Tournament Kit? Please note: The alternate art cards in this kit are produced through FFG's In-House Manufacturing, and as such, they may appear slightly different in color and texture from the game's other cards. Don’t miss out on Summer 2015 Star Wars: Armada Tournament Kits! Order your kits now through your distributor or our B2B store and be prepared for epic fleet battles throughout the summer.